Earlier this month, Mansfield Fellows Richard Banh and Michele Tempel participated in a week-long placement with Panasonic Corporation in Japan. 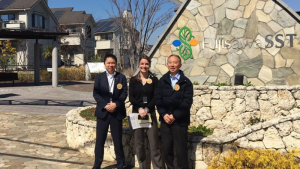 The Fellows learned about non-grid and ecologically friendly solutions to energy constraints in Japan, visited Fujisawa Sustainable Smart Town (pictured above), and learned about how the company will support the 2020 Paralympics in Tokyo. During this placement, the Fellows met with Mansfield Board Member Masato Nakamura, Mr. Wataru Nomiyama, and others at Panasonic. Tomorrow, Mansfield Fellow Ian Morrison (National Weather Service) will discuss how natural disasters are forcing evolution within weather agencies. The GRIPS-Mansfield joint seminar will review the responsibilities of national weather agencies, describe how U.S. and Japan agencies are changing their strategies, and examine the results thus far. For more information on this event, visit our website here. This entry was posted in Fellowship Experiences and tagged General Services Administration, MFP No. 23, National Oceanic and Atmospheric Administration, National Weather Service, Panasonic, the National Graduate Institute for Policy Studies (GRIPS), U.S. Air Force, United States Air Force. Bookmark the permalink.